In the Miami Valley, boilers still have a role to play in heating your house or business. Modern boilers heat and treat indoor air while being more energy efficient than older units. 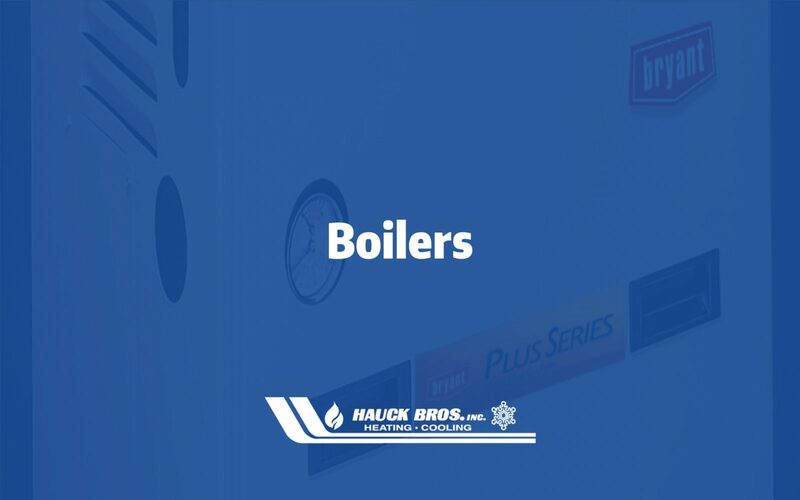 You can rely on the professionals at Hauck Bros., Inc. to install a boiler for the first time, replace an outdated or boiler, or service your current system. Since 1921, we proudly serve both residential and commercial customers with the industry’s leading equipment that will provide comfort for years to come. A boiler is a sealed system that contains the combustion of fuel, including coal, oil, natural gas, and liquid propane to heat water. Boilers use hot water distributed throughout the building in pipes to provide heat a heat transfer. This allows for individual controlled heat to each room, or zoning. Fire Tube – Fire tube boilers confine the combustion process and gases in tubes and water circulates around these tubes. Some fire tube boilers have turbulators inside of the tubes to cause turbulence of the flue gases. This increases the heat absorption into the water which makes the boiler more efficient. They are generally used for medium to large boiler commercial/industrial applications. These boilers can be either steam or hot water boilers in low to medium pressure applications. Water Tube – Water tube boilers have many different tubes inside of it that have water circulating through them. Hot combustion gases surround these tubes and an exchange of heat is realized. The heat exchange is between the combustion gases and the tubes and water. The water tube boilers can be built for higher capacities and pressures than the fire tube boilers because the steam and/or hot water is confined in the tubes. These boilers are generally found in medium to large commercial/industrial applications. Steam Boiler – delivers hot steam to radiators and bring back cooled condensation into the boiler system to be reheated. Steam boiler need a pressure relief valve and a low water cutoff. Most steam boiler have manual valve to allow for added water to enter the system when needed. Hot Water Boiler – use a series of pumps to circulate heated water through the building and into the radiators. Hot water boiler systems typically have an expansion tank. When it comes to boilers, the fuel type helps distinguish which type of boiler you may need and the features available to your setup as well. For most residential and commercial applications, natural gas, liquid propane, electric, and oil are the main source of fuel. Modern boilers have the ability to keep you comfortable during the heating season in a variety of ways. Some models are designed to be easy to service, with annual maintenance recommended on every boiler, having the unit easy to service makes it easier to repair a problem which could save you time and money. The more efficient the boiler the more it saves you on heating bills, especially over 15 years. Some models are quieter than others depending on the design and functionality. Older units have a rating of 56%-70% AFUE rating. Newer non-condensing units have a 80%-88% AFUE rating. Newer condensing units have an 89%-95% AFUE rating. Condensing units have a secondary heat exchanger for better efficiency. Based on the US National Average for 2017, an 80% AFUE unit would save over $7,500 vs a 60% AFUE over 15 years. A 90%+ AFUE unit would save over $10,000 over 15 years. Traditional boilers and combination boiler share the same task of heating your home by going through your system to radiators or radiant floor systems where it provides heat to warm the air. Traditional boilers heat water in a tank on constantly, ready to provide heated water when needed. Combination boilers has no storage tank, it heats the water as needed and can provide hot water for the whole house, one source at a time. A combination boiler is great choice for a smaller building, with little need for constant hot water. Look for models that are easy to service to save time and money on annual maintenance charges. Make sure a certified technician proves annual maintenance to avoid breakdowns and extend the life of the boiler. When doing a replacement or refurbishment project, the existing heating design dictates what can and cannot be done. New construction or builds offer more freedom in the heating design, but can be more restrictive on building regulations. There are 4 different main heat exchangers to choose from. 1. Cast Iron, heavy, but not easy to break, cast iron feature a sectional heat exchanger design. Ideal for replacements due to their ability debris from the older system. Tend to not be energy efficient unless they have a secondary heat exchanger that enables the boiler to condense. 2. Aluminum, lightweight and excellent at heat transfers, they can be used with other materials to enhance their overall strength. Good water quality must be provided to avoid corrosion. 4. Steel and Tube, used in higher output systems. They can corrode easily, and our not suitable for condensing without a secondary heat exchanger. Usually used in commercial and industrial type buildings. For residential units under 300,00 BTUH of input, boiler efficiency is measure by AFUE (Annual Fuel Utilization Efficiency). AFUE is a calculated efficiency which attempts to estimate how well the boiler coverts the energy in its fuel to heat over the course of one year. Simply put, older furnaces had as low as a 56% AFUE rating, there are models today that can get above a 95% AFUE rating. The higher the AFUE the more efficient the unit is, this saves money on utility bills in the future. Based on the US National Average for 2017, an 80% AFUE unit would save over $7,500 vs a 60% AFUE over 15 years. A 90%+ AFUE unit would save over $10,000 over 15 years. Boilers need regular maintenance to prevent breakdowns and, in some cases, to keep the warranty valid and active. There are some simple checks you can do to make sure your boiler stays out of trouble. Make sure all air vents are working, not blocked, and clear of debris around them on the interior and exterior of the building. Make sure to check the water level, if it operates without water the boiler could be seriously damaged. If you are uncomfortable doing any of these tasks, please contact us at 937-325-0636 or fill out this form and we will reach out to you within 24 hours. Boilers need regular maintenance once a year. There are two great reasons to have a boiler maintained annually. First, having an annual maintenance check done helps prevents sudden failures. Second, some manufactures require annual maintenance to keep their warranties valid. During the inspection our technician will check shut off valves to ensure they are working properly, check the refractory, check for cracks, check the controls, check indicators, and safety devices to ensure they are all working properly. The technician will also inspect the fuel feed systems and clean the burners to ensure they are working properly. Yellow flames on gas burners and black soot on oil boilers, indicates the fuel is not burning properly, this can create carbon dioxide. Leakage, if the boiler needs more water to run than it might have a leak. Consider replacing before flooding occurs. Age, most condensing boilers last for 15+ years, cast iron 20-30 years, with proper annual maintenance by a licensed technician. Comfort, if your building starts to have hot or cold spots in areas that it didn’t before, it could be that the unit is not operating as efficiently as it once did.